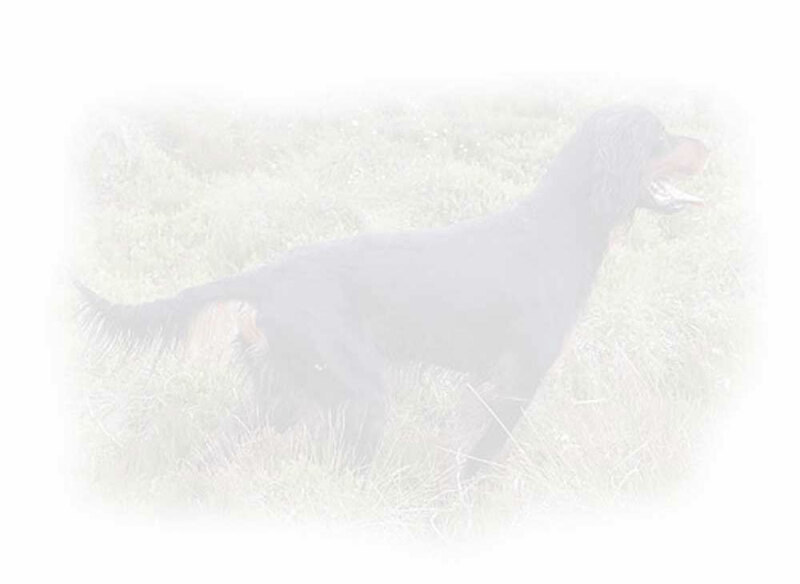 An aspect of gundog performance in Field Trials receiving scant attention and arguably conspicuous by its absence is the registering of the name of the Handler when recording a dog's awards, particularly in that bible of successful award winners and therefore by implication potential progenitors, the Kennel Club Stud Book. A totally diametric approach to the eminently sensible practice in horse racing, from whence much competition dogwork litany was purloined. In this discipline one of the more important catalysts influencing any future successful achievement is 'who rode the winning horse?' That such filching from horse lore for canine purpose is selective can be illustrated; the age of a Puppy for Puppy Stake purpose is (until recently) defined in similar fashion to the way the Jockey Club interprets the age of a horse, all of which have the same birthday date of January 1st. The name of a Trial winning dog Handler is however, apparently considered of little significance when chronicling such feats for posterity; regrettable, since it has to be recognised that closely akin to the subtle coalition of horse and Jockey, the Handler and dog combination can also have significant influence on the eventual outcome and whilst the expending of time and effort searching pedigrees and tracing lineage will hopefully ensure ever more successful future progeny, this then begs the question as to the influence of any performance enhancing capabilities possessed by a Handler which may well have been neglected when coming to a decision regarding future breeding plans. It is true that serious breeders will already be au fait with the identity of the more significant Handlers and the important contribution they make towards a result, but the current situation denies this intelligence to those not so well versed, including perhaps, interested overseas enquiry. The history of shooting when allied to gundog work may have suffered from past Nepotism in the master and servant approach. Pre war, many dogs were handled by paid employees, the keepers and dog men. It was obviously thought to be no great part of the breeding equation as to who was actually working the dog as long as a satisfactory performance was returned. There is the story of the guest at Holkham Hall many, many years ago, who after shooting all day over a very good dog, approached Lord Coke to compliment him on the dog and in the process enquired as to the Handler's name. 'I really couldn't say ', responded His Lordship laconically, ' but I suppose we could find out for you if you really want to know '. Q.E.D. In any case, they were 'professional' Handlers and considered very competent (which they largely were) and any minute variation in influence could be weighed and taken into account. Times change, and a Field Trial Handler today is in all probability also the Owner. To what degree is Handler influence inadvertently and possibly falsely attributed to being the result of breeding influence? Perhaps to a greater extent than might be thought. Having come to a conclusion that the immediate forebears of a proposed litter are of sufficiently high merit in the world of competition gundogs, this suggests that the siblings will also have a programmed aptitude to reach similar pinnacles; we have to work on that premise. Coupled with Handler ability is not only the availability of appropriate ground on which to practice dogwork, but ground with suitable terrain and gamebird population. Despite this assertion, exceptions to the rule reveal that there are those who are able, by means not readily discernable, to keep a gundog in a high rise flat, the local park almost the only available running ground, yet still contrive to produce a dog as a serious competitor. Further observing the diverse environments and varying proficiencies of Handlers to which the pups will be individually subject, a few pups will make the grade, some be adequate and some will be a disappointment, surely in part this must be reflected in the ability or otherwise of the Trainer / Handler? Similarly in the horse racing world, it is apparent that all horses are not cloned equals, and the combined efforts of trainer, head lad and groom are as naught until the final contribution by the jockey, that significant provider of the final ebullience which surely influences the outcome of a race, ignoring for the moment the myriad of imponderables that can impinge on the result; so it is in Field Trial competition. The common irony contained in both horse race and Field Trial is that if either were re-run again tomorrow, the result may well not be the same; placing perhaps reversed or in extremis, totally different. The dog's Trainer and the Handler may of course not be one and the same person, but ultimately the Handler, relevant to ability will either consolidate the work of the Trainer or damage it in some major or minor way to handicap the dog in competition. What price pedigree under these considerations? That is not to take away any kudos surrounding the aura of pedigree, which, disregarding any rare occasional impropriety is an almost sacred record, sometimes over Centuries, of a dog's antecedents and associated abilities. A hopefully accurate breeding chronology, which can be relied upon to give an anticipated indication of specialized abilities. But it is important not to be blinded by the splendour of such narrative to the exclusion of other contributory considerations whilst still taking cognisance of that impressive list of red inked Field Trial Champions in a pedigree. A skilled Handler, again akin to the jockey, can repeatedly bring his charge into the awards in situations that other less well versed Competitors might fail to exploit and whilst obviously and essentially the breeding played a huge part, Handler proficiency will also have contributed to any success. Granted, all the pups in any one litter will not be uniform in temperament or potential ability, although there is always at least one breeder who will insist that such is not the case with his own lines! This poses the further question of early selection of a pup that fills personal criteria, one that gut feeling tells you is the one for you, since the time has long gone through modern day economic constraints when a whole litter could be run on for eight to ten months until that sought after potential becomes easier to identify. There has latterly been some infiltration from the show world. Those with dogs that have gained a Show Champion award can attempt conversion to Champion status by winning an award at Trials or gaining a Show Working Gundog Certificate whilst others have a mission to prove that working instincts endure within their charges; sometimes, to their gratification there is positive result; on other occasion disappointment and it has to be conceded that even the most erudite and expert Handler may have great difficulty in achieving success with a pup of indifferent breeding. Is that old saw so definitive then... blood will tell, what is bred in the bone? 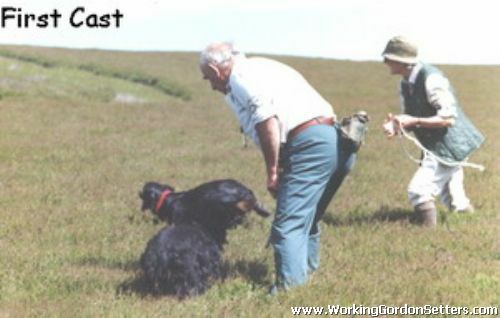 Thought for the day: Old time Handler's assessment of dog work. It is the quality of performance rather than the frequency of the occurrence! "Our Assarts/Gawcott Kennel, now with over sixty years experience in working Gordons both here and in Africa is located in Upper Weardale amid some of the finest grouse moors in Britain. We believe that dogs should, as an integral part of their background and quite apart from competitive Trials, experience work in a true sporting context. Being shot over is considered a necessary essential to complete training and resumes priority as the original primary intention. We continue to breed dogs that can fulfill these requirements, having consistently produced Field trial Champions and award winners that not only work authentically and honestly but are also of correct work conformation with a temperament to mix with anyone, including children. This shooting of game over the dogs on a regular seasonal basis not only displays to the dogs that there is an end product, but also confirms that dogs used for competition are also capable of a hard day's work on the hill when putting game in the bag. Looking back over years of Gordon Setters I can personally say they have given an immense amount of pleasure, even taking over a major portion of life to the extent that one tends to perhaps become a bore, only showing scant interest in any aspect of life that does not include Setters, shooting over dogs and allied country interests!"